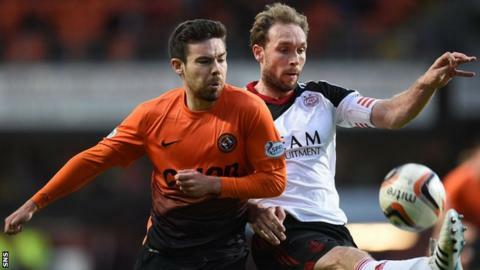 Dundee United manager Jackie McNamara questioned the offside decision that denied Ryan Dow a goal in the 3-1 defeat by Aberdeen. United were trailing 2-1 when Dow knocked the ball over the line only to have his celebrations cut short by the assistant referee's flag. "Dow's goal was perfectly okay," said McNamara. "We were on the ascendancy. "I don't think we deserved to lose but when you make mistakes, it can be costly." Sean Dillon levelled the match after Scott Vernon had fired the Dons ahead and the striker added two more goals to give the visitors victory. "Their goalkeeper has made three or four great saves to keep them in the match," added McNamara. "With the effort the boys put in, the creativity and the chances created, I'm disappointed for them to lose but it's about concentration. I think the three goals were preventable."